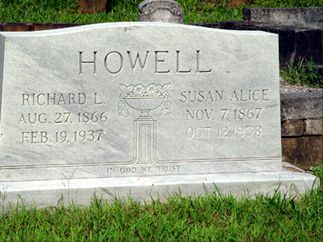 Richard L. Howell, son of Rebecca Summey Howell, husband of Susan Alice Elliott. Susan Alice Elliott, daughter of George and Nancy Elliott, wife of Richard Howell. After an illness of many months duration, Mr. Richard L. Howell, 70, beloved resident of Bartow County for many years, passed away at his home here late Friday evening. He had been in failing health for some time and the end was not unexpected. Funeral services were conducted at Macedonia Sunday morning at 11 o’clock, Rev. W.E. Hembree officiating in the presence of a large following of sorrowing relatives and friends. Interment was in the family lot at Macedonia cemetery. Cummings-Long-Owen were in charge of funeral arrangements. Born in Bartow County in 1887, a son of the late Mr. and Mrs. Steve Howell, Mr. Howell spent much of his life-time here, although he made his home in Cherokee County for a number of years. He has many prominent family connections here and had a wide circle of friends throughout this section. He and his wife, the former Miss Alice Elliott, only recently celebrated their fiftieth anniversary. Besides his wife, he is survived by one son, Mr. Jesse A. Howell of Cartersville and six daughters. They are Mrs. B.T. Abernathy, Mrs. Silas Hardin, Mrs. E.R. Abernathy, and Mrs. J.M. Tidwell of Cartersville; Mrs. W.A. Abernathy of Woodstock and Mrs. J.T. Abernathy of Acworth. Three brothers and one sister also survive. They are Messrs R.W., W.M., and J.D. Howell of Cartersville, and Mrs. Nancy Banks of California. Tenderest sympathy is extended to members of the bereaved family in their great loss. Funeral services for Mrs. Susan Alice Howell, 70, beloved Bartow county matron who died at her home on Etowah Drive here early Wednesday morning, were conducted Thursday morning at 11 o’clock from Macedonia church. Rev. W.C. Hembree officiated in the presence of a host of sorrowing relatives and friends. Interment was in Macedonia Cemetery, sons-in-law of the deceased serving as pallbearers. Owen Funeral Home was in charge of arrangements. Born in Cherokee County, Mrs. Howell was a daughter of the late Mr. and Mrs. George Elliott, who settled in Cherokee many years ago, coming to Georgia from their native South Carolina home. She was a member of the Baptist church. A kind and devoted mother, a loyal neighbor and friend, Mrs. Howell’s gentle kindness will be missed by all who knew her. Her husband, the late R.L. Howell, preceded her in death in February 1937. Survivors include one son, Mr. Jesse Howell, of Cartersville; six daughters, Mrs. E.R. Abernathy, Mrs. B.T. Abernathy and Mrs. J.M. Tidwell, all of Cartersville; Mrs. J.T. Abernathy of Acworth; Mrs. W.A. Abernathy of Woodstock, and Mrs. Silas Hardin, of Rydal. Several grandchildren and great-grandchildren also survive.